Usually diets and hunger seem to be synonymous. They don’t have to be! It has been years of controlling appetite, working toward eating healthy and keeping weight at a happy place for me. Really, it isn’t easy, but it is very worth it! That is why I want to share what helps me so that I pray it can help you too. I’ve found that when I feel hungry all the time, I realize I’m slipping and letting refined sugar creep up in my diet repertoire. Here’s what I do: take 1 to 2 days and make smoothies for breakfast or lunch. (Make sure to eat a healthy breakfast if you choose to have your smoothie for lunch). Then, I eat a light lunch and a healthy dinner, and nothing more for the rest of the evening. I find it takes the edge off cravings, and gets me back on track quickly. Below is a chart from a trusted resource, Whole Life Nutrition, with some smoothie recipe combinations. They also have a cook book called Nourishing Meals that is excellent. Contact me and we can talk more about what can work for you to combat hunger. We are all different and finding what helps is a key to both weight loss, feeling healthy and maintaining the rewards!! Don’t let the title fool you. This isn’t just for kids! This morning I made a smoothie for myself. I sipped this delicious breakfast in a cup the front end of the day, and it helped control my appetite up until a late light lunch. 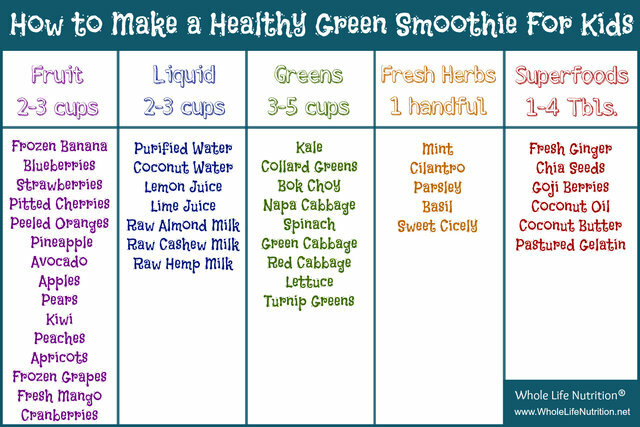 For one person, I kept the ratios and reduced the liquid and fruit to 1 cup, the Greens about 2 cups, and I kept the superfoods (I like chia seeds, but you can also use raw almonds/almond butter or peanuts/peanut butter) to 1 tablespoon or less. (I also added about 1/2 tbs. raw honey to sweeten it up a bit, and to help out my allergies). Give it a try!